Two Bucksport buildings disused since the closure of the Verso Paper mill (background) will be put back into use now that a town church has bought them. The owner of the former Verso Paper mill site has sold two former mill buildings to a Bucksport church for an undisclosed price. Bucksport United Methodist Church plans to celebrate its move from 71 Franklin St. to a former mill fitness center at 3 River Road with a transition procession on Palm Sunday, which is April 14 this year, Pastor Pete Remick said Friday. The sale of the center, and a smaller former mill credit union building on the same lot, caps several years of struggle as the church sought to replace its deteriorating Franklin Street building. It is also another sign of recent activity with AIM Development, a subsidiary of a Canadian scrap metal firm that bought the mill site at 2 River Road for $58 million in 2015. The paper mill shut down at the end of 2014. AIM has increased the pace of demolition work at the mill site as it prepares to close purchase-and-sale agreements for lots within the site with Maine Maritime Academy, which plans to build a continuing education annex, and Whole Oceans’ $250 million indoor salmon farm. Both deals are pending, AIM officials have said. Whole Oceans is doing its due diligence on the property and could conclude a sale within a few weeks, company President Jason Mitchell said Wednesday before meeting with Town Manager Susan Lessard. The church finalized the deal on March 7, according to paperwork filed at the Hancock County Registry of Deeds. Remick, who declined to disclose the buildings’ sale price, thanked church supporters for their patience. “It has been a long hard journey,” Remick said Friday. At the town’s present mill rate, $16.30 per $1,000 of personal property, the purchase of the two buildings, which were valued at $816,820, effectively deprives the town of about $13,314 in annual property tax revenues. As a nonprofit organization, the church does not pay property taxes, Lessard said. 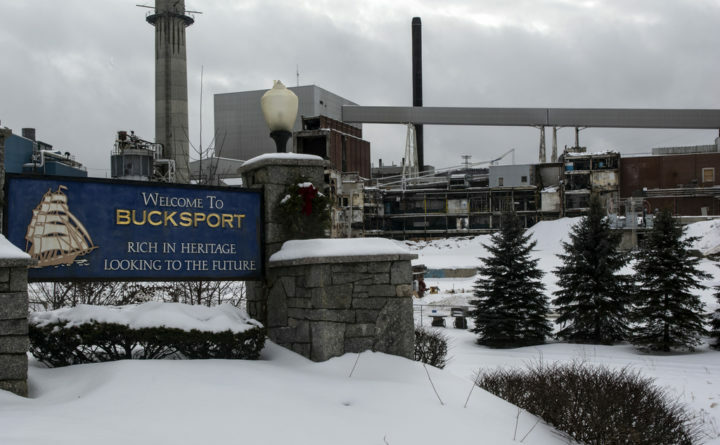 Bucksport’s total gross budget last fiscal year was $9.9 million. Some residents have expressed concerns about the revenue loss, but the church had “a legitimate right to purchase from AIM and they [AIM] have a legitimate right to sell it,” Lessard said. The church plans to use the fitness center as a sanctuary. Other parts of the building will be used for aerobics classes and outreach programs. Eventually the church will use it for receptions and other gatherings, Remick said. The use for the credit union building is less clear. The building had been abandoned for at least five years and has a leaky roof. Church members are appraising both structures for their best uses, Remick said.